How do you nurture yourself on a day when you’re feeling down? Sarah Ban Breathnach, in her book Simple Abundance, suggests two alternatives: Eat some good comfort food and go to bed, or shift gears by getting fixed up nicely and going out. In either case, just remember that the day will soon be over, and that there’s always a gift to be found in even the most discouraging day. Last week, I was feeling a bit stressed because of some disruptive stuff that had been going on; and then I noticed that my watch battery was running down. My husband and I have a matched set of water-resistant Tissot watches, which have to be sent back to the manufacturer when they need the battery replaced. His watch battery lasts for many years, but mine doesn’t last nearly as long because women’s watches (and their batteries) are so much smaller than men’s. So I’d have to go without my watch for about a month, while feeling discombobulated the whole time. My husband offered to take it to the jeweler’s for me, and I gave it to him before he left for work Friday morning. I reminded myself that I should just be happy to have a good-quality watch, my life is full of blessings, and replacing a watch battery is not a big deal. Still, it wasn’t much fun when I looked at my wrist out of habit and found no watch there. I thought I’d probably have a quiet evening—just browse a few blogs and maybe do some reading on my Kindle. When my husband sent me a text message to say he was on his way home, he also said he’d gotten something for me. That added excitement to the day! 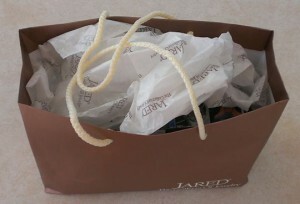 I looked in the gift bag from the jeweler’s and found a new watch in there. It’s a style similar to the other one. I wouldn’t have thought of buying an “extra” watch for myself, just to wear for a short time every year or two, because that would have seemed too frivolous or extravagant; but what a lovely present it made! Although not every stressful day literally ends with a present in a gift bag, I do believe there are gifts to be found in every day, whether they’re actual physical objects or something more abstract like a new insight on life. The key is to stay aware of what’s going on in the moment, so as not to overlook them. I read Simple Abundance years ago, such a great book! How thoughtful of your husband to pick you up a new watch, those little unexpected gifts are the best! Yes and yes! Thanks for stopping by to visit — good to see you here! Yes indeed — very much so!! Pingback: Nurturing Thurs – Emanate | "On Dragonfly Wings with Buttercup Tea"
What a lovely post Meg. Looking for the gift within each day is a wonderful concept – whether it be a physical gift or as you say, a new insight into your life. Thank you for your thought-provoking post. Glad you enjoyed the post, Lucy — thanks for commenting! Pingback: Nurturing Thurs – Thoughts | "On Dragonfly Wings with Buttercup Tea"
Yes, he certainly is. 🙂 We’re celebrating our 26th anniversary this week. By cultivating the attitude to find the unexpected gift in a day, we can’t help but be excited about what we will discover! Sometimes, it may feel more like a scavenger hunt, but I agree, there is always something (however little) to cause us to smile! Indeed, even when it feels like a scavenger hunt there’s always something to discover! Pingback: Nurturing Thurs – Broadcasts | "On Dragonfly Wings with Buttercup Tea"
I’ve been working on a daily meditation book for a long time with this exact title and I just launched my blog last week that you may want to check out sometime. It will be loaded with metaphors and lessons in every day life, like you just shared. I would love your added perspective to my blog posts!